The sun will be turned to darkness,and the moon to blood,before the great and awe-inspiring day of the Lord comes. Stargazers will witness a trifecta of lunar events in the New Year — a total lunar eclipse, a super blood Moon and a “Wolf Moon,” a nickname for a full Moon that appears in the middle of winter. 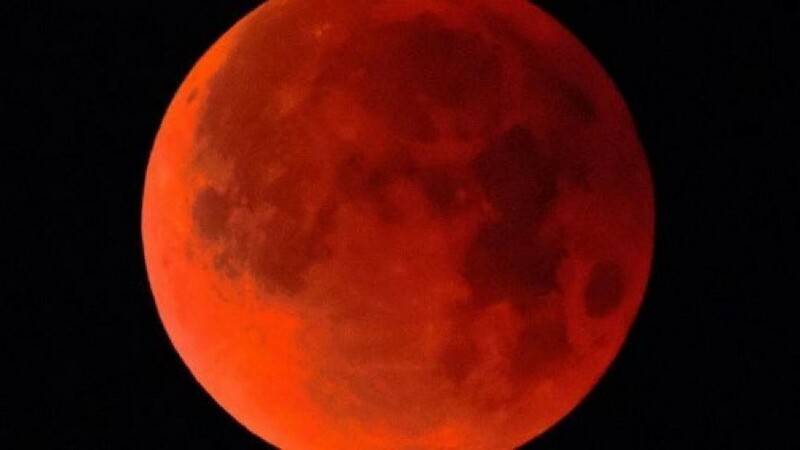 Millions of people across North and South America and portions of western Europe and Africa will be able to catch the rare sight overnight on January 20 into January 21, according to National Geographic. For a few hours, the moon will give off a bright reddish glow. “A total lunar eclipse can happen only when the Sun, Earth and Moon are perfectly lined up — anything less than perfection creates a partial lunar eclipse or no eclipse at all,” Space.com explains. You won’t want to miss it. Earth won’t experience another total lunar eclipse, which occurs when the entire Moon enters Earth’s shadow, until May 2021, NASA estimates. Here’s everything you need to know about the unusual phenomenon. When can I see the 2019 total lunar eclipse? The longest possible lunar eclipse is 1 hour and 47 minutes, according to EarthSky. The longest total lunar eclipse of the last century was on July 16, 2000, and lasted for 1 hour and 46.4 minutes, the space site notes. The last total lunar eclipse took place on July 27, though it wasn’t visible in the U.S.
What is a “super blood moon”? A supermoon is a new or full moon that appears closer than usual because it’s the closest distance the moon gets to Earth during its orbit, known as “perigee” located about 363,000 kilometers from Earth, NASA says. Supermoons typically appear 14 percent larger and 30 percent brighter than the average moon seen in the sky each night, Dr. Noah Petro, a research scientist from NASA’s Goddard Space Flight Center, previously told Fox News. However, it’s hard to really spot the difference with the naked eye. “That’s not enough to notice unless you’re a very careful moon-watcher,” Sky & Telescope magazine senior editor Alan MacRobert told Space.com in 2016. The term “blood” stems from the rusty brownish-red color the Moon turns during a total lunar eclipse. “That’s because some of the sunlight going through Earth’s atmosphere is bent around the edge of our planet and falls onto the moon’s surface. Earth’s air also scatters more shorter-wavelength light (in colors such as green or blue); what’s left is the longer-wavelength, redder end of the spectrum,” Space.com states on its website. What is a “wolf moon”? The January full moon was nicknamed the “wolf Moon” — and occasionally the “Old Moon” — by Native American tribes after wolves that howled outside as they hunted for food in mid-winter. “This is an age-old practice, nothing new. Ancient peoples commonly tracked the seasons by following the lunar calendar (versus today’s solar calendar),” The Old Farmer’s Almanac explains in a post online. On August 27, four enormous explosions occurred. At 5:30 am, the first explosion was at Perboewatan, triggering a tsunami heading straight to Telok Betong, now known as Bandar Lampung. At 6:44 am, Krakatoa exploded again at Danan, with the resulting tsunami stretching eastward and westward. The largest explosion, at 10:02 am, was so violent that it was heard 3,110 km (1,930 mi) away in Perth, Western Australia, and the Indian Ocean island of Rodrigues near Mauritius, 4,800 km (3,000 mi) away, where they were thought to be cannon fire from a nearby ship. The third explosion has been reported as the loudest sound heard in historic times. :79 The loudness of the blast heard 160 km (100 mi) from the volcano has been calculated to have been 180 dB. Each explosion was accompanied by tsunamis estimated to have been over 30 meters (98 feet) high in places. A large area of the Sunda Strait and a number of places on the Sumatran coast were affected by pyroclastic flows from the volcano. The energy released from the explosion has been estimated to be equal to about 200 megatons of TNT, roughly four times as powerful as the Tsar Bomba, the most powerful thermonuclear weapon ever detonated. A volcano in central Indonesia haserupted, sending columns of thick ash spewing as high as 25,000 feet into thesky. Mount Soputan, a 6,000ft peak inMinahasa on the northern part of Sulawesi island, erupted twice on Sundaymorning. A two-and-a-half mile exclusion zonehas been enforced around the mountain as the national disaster agency warnslocal residents to avoid the peak. Those eruptions may have been morespectacular, but the eruption that we just witnessed down in Mexico ispotentially much more concerning. The active volcano Popocatepetl,located in Central Mexico, has exploded Saturday evening, sending ash twokilometers into the air with the cloud of smoke moving in a northeastdirection. Videos from the eruption show apowerful explosion and traces of magma flowing out of the crater. Possible ashfall is expected in areas surrounding the summit. At the moment the volcanicwarning issued by the Federal Civil Protection remains at ‘Phase 2’. Approximately 25 million people livewithin striking distance of Mt. Popocatepetl, and scientists assure us thatsomeday the 5,426-meter-high “smoking mountain” will devastate the entireMexico City region. And when I say “devastate”, I am notjust talking about a disaster that will inconvenience people for a few weeks. Historians tell us that Popocatepetlhad a dramatic impact on the ancient Aztecs. Giant mud flows produced bymassive eruptions covered entire Aztec cities. In fact, some of these mud flowswere so large that they buried entire pyramids in super-heated mud. But we haven’t witnessed anythinglike that in any of our lifetimes, so it is hard to even imagine devastation ofthat magnitude. In addition to Mexico City’s mammothpopulation, there are millions of others that live in the surrounding region.Overall, there are about 25 million people that live in the immediate vicinityof Popocatepetl. Thankfully, we haven’t seen a major eruption of the volcano inmodern times, but at some point that will change. 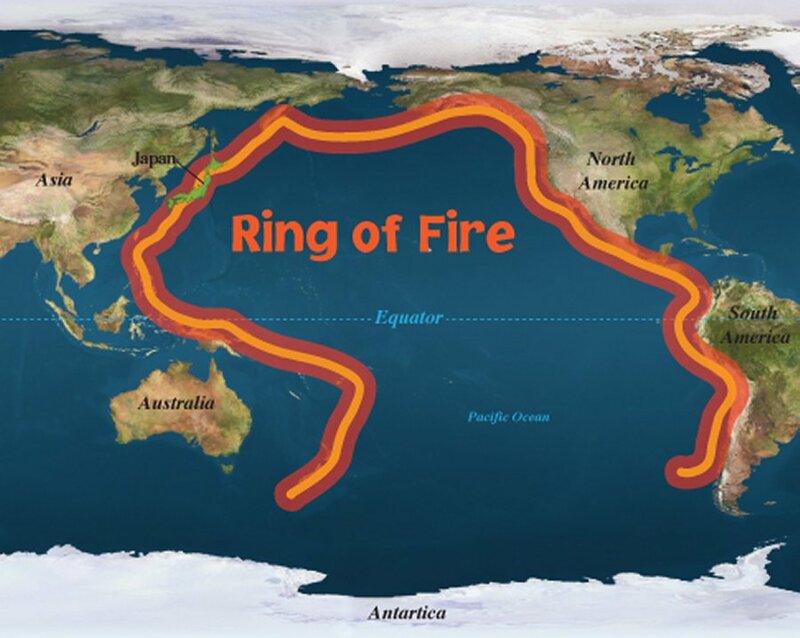 Meanwhile, significant earthquakescontinue to rattle areas all along the Ring of Fire. A 5.9 magnitude eathquake has struckWestern Australia, 203km northwest of Carnarvon at 22.26pm local time (2.26pmBST) at a depth of 10km. Locals in Carnarvon reported felingtremors, after the massive earthquake shook the region this afternoon. We live at a time when seismicactivity isbecoming more intense and more frequent. Some of the “experts”in the United States insist that the numbers are rising simply because we aredoing a better job of “detecting” seismic activity these days, and they promisethat we have absolutely nothing to worry about. But a lot of people areskeptical of that explanation, because they can see that our planet appears tobe getting increasingly unstable. Could it be possible that an era ofdramatically increased seismic activity is about to change all of our lives ina major way? Yellowstone volcano has a rival inEurope, according to a recent study from scientists based in the region. Thevolcano is based in Naples to the west, in a place known as Phlegrean fields,once the site of a world-changing eruption. Scientists have now picked up onnew signs of the volcano complex starting another cycle. This particular volcanois a threat as the end point of the major cycle could be a significanteruption, rivalling the outcome of a Yellowstone eruption in the US. Scientists observing the volcaniccycle of one Campi Flegrei, located in Napoli, are concerned of a “potentialreawakening”. Of course we have seen many formerly“dormant volcanoes” reawaken in recent years. Something very unusual definitelyappears to be happening to our planet, and unlike the mainstream media in theUnited States, this is something that we will be keeping a very close eye on. After four years of total silence, the Steamboat Geyser in Yellowstone National Park in northwest Wyoming came back to life on Saturday, shooting steam 200 feet into the air. Steamboat is the largest in the world with eruptions reaching up to 400 feet. This latest eruption set a new record for the geyser of 30 eruptions in one year. The previous record of 29 eruptions was set in 54 years ago in 1964. The geyser erupted for the first time this year on March 14. It was the first activity at the site since 2014. The geyser is unpredictable with eruptions dispersed anywhere from days to years apart. The geyser did not erupt at all from 1911 to 1961. Yellowstone park is seismically active with more than 10,000 thermal features of which more than 500 are geysers. A correlation between geyser activity and earthquakes has not been proven, but some scientists believe that geological shifting may lead to increased geothermal events. The Yellowstone region has seen a period of increased earthquakes and swarms of minor tremors. In June 2017, the Wyoming area of Yellowstone was hit by a persistent swarm of approximately 2,400 tremors. These swarms are continuing this year at a slightly lower rate. Rabbi Yekutiel Fish, author of the Hebrew Torah blog, Sod HaChashmal, emphasized that forces of nature, such as earthquakes and volcanoes, are manifestations of God’s judgement, denoted in the Bible by His name ‘elohim.’ The rabbi noted that the seismic aspect of God’s influence in the world was explicitly described in Psalms. In fact, scientists have predicted that this year could see a surge in seismic activity around the globe. In their study published in Geophysical Research Letters, Roger Bilham and Rebecca Bendick presented a model that predicts that 2018 will be the opening of a window of potentially increased large earthquake activity due to slight changes in the spin-rate of the Earth. The rate at which the planet spins changes cyclically and the scientists claim that five to six years after a period of relatively slow spin, a 30-percent increase in seismic activity takes place. Though they are unsure of the duration of the increase, they conjecture it can last up to five years. The last global slow-down took place in 2012. Scientists have also noted that during periods of decreased glaciers it is easier for magma to reach the surface and feed volcanic eruptions. It can take thousands of years after the glaciers melt for volcanic activity to rise. Several studies over the last 40 year have suggested that, as the ice vanished, volcanic eruptions became much more frequent. A 2009 study, for example, concluded that between 7,000 and 12,000 years ago, the global level of volcanic activity rose by up to six times. Around the same period, the rate of volcanic activity in Iceland soared to at least 30 times today’s level. Though the cause of climate change is currently a matter of debate in the scientific community, it is generally accepted that temperatures around the globe are rising. If so, this may lead to increased volcanic activity. Although the probability of an eruption at Yellowstone is minuscule, only a one in 100,000 chance in any given year according to scientists, the results of such an event would be catastrophic in the extreme. The Yellowstone Caldera is listed as the most dangerous supervolcano in existence and as such, is the most monitored volcano in the world. It has erupted three times over the last 2 million years, most recently about 70,000 years ago. The biggest danger from an eruption is not the lava but the ash. The Yellowstone eruption two million years ago produced 2,500 times as much ash as the 1980 Mount St. Helens eruption. Ash is caustic when inhaled and volcanic eruptions can spew the ash high into the atmosphere. The pileup of ash on rooftops has resulted in building collapses. A Yellowstone supereruption would disrupt electronics and endanger human health in Montana, Idaho, Wyoming, and affect other parts of the country. Moreover, a month-long supereruption could affect the global climate for several years. In comparison, relatively minor eruptions at Eyjafjallajökull, Iceland in 2010 led to 20 European countries shutting down their commercial air traffic for one week, affecting more than 20 million travellers. Major volcanic eruptions that spew ash into the atmosphere obscuring the sun can lead to a volcanic winter in which global temperatures drop. The phenomenon is not infrequent, occurring approximately once each century. The most recent took place in 1991 after the explosion of Mount Pinatubo in the Philippines, cooling global temperatures for about three years. A more significant drop in temperatures could lead to a global crisis in food production. NASA scientists assured the public that the likelihood of a supereruption is minuscule but nonetheless conducted a study in 2017 to determine the feasibility of preventing the volcano from erupting. NASA proposed introducing water at high pressure six miles underground. Nevertheless, according to Brian Wilson of the Jet Propulsion Laboratory, the project might trigger, instead of prevent, an eruption. In his weekly sermon last week, Rabbi Nir Ben Artzi predicted that all manners of natural catastrophes are going to increase in the coming year. “God will judge, ‘who to life and who to death,’” Rabbi Ben Artzi said. He also predicted that international conflict will increase. “The heart of the king is in the hands of God,” he said. In a previous sermon, he explained why God uses nature in this manner. Rabbi Fish emphasized that it is a mistake for men to think they can control nature.